U.S. military equipment has become more sensitive to environmental conditions than ever before, especially with increasing application of sophisticated microprocessors, wireless connectively, and sensors commonly employed on highly maneuverable armored vehicles. Increasing development of military technology requires considerably more comprehensive information about the extreme testing environment (i.e., natural environmental test sites) than was required nearly a half century ago. An all-encompassing research, development, and testing program for current and new designs of tracked and wheeled military vehicles, the primary means of transport for U.S. ground forces, depends on the use of an extensive network of vehicle mobility and durability (i.e., endurance) test courses located in a variety of temperate, tropical, desert, and cold region environments. Most of these test courses consist of unimproved, dirt or gravel roads, primarily developed on the native soil and landscape. Although several of these test courses have been in use for nearly 50 years, many of their geotechnical attributes have not been characterized. In support primarily of the Army’s Test and Evaluation Command (ATEC) mission, the Department of Geography and Environmental Engineering (GEnE) from the United States Military Academy (USMA) at West Point and the Desert Research Institute (DRI) characterized numerous test courses at various geographic locations. Since 2007, multiple teams from West Point, primarily consisting of Cadets with supervising officers, have worked in collaboration with DRI to characterize geotechnical attributes of soils along test courses in desert, arctic, temperate and tropical landscapes. These data collection activities also support the Army in providing future officers with field training associated with sample collection and data management. The characterization activities focused on making geotechnical measurements, sampling soils, collecting imagery, generating map data, and developing geospatial databases. This effort also included the preparation of databases of in situ geotechnical properties along test courses at representative locations to a depth of ~ 0.3 m (1 ft) that included the measurements of: soil stiffness and modulus, penetration and shear resistance, bulk density, and particle size distribution. These new data sets will assist the Department of Defense (DoD) and the Department of the Army (DA) in maintaining a varied and detailed inventory of characterized soil-landform assemblages in different fundamental environments from various test sites throughout the U.S. and abroad. In addition, the data collected and the information compiled through these site studies will also benefit the DoD community that tests emerging technologies for the detection and defeat of Improvised Explosive Devices (IEDs), which require significant understanding of the natural variability of both physical and chemical soil attributes. This paper is a result of multiple discussions and working groups facilitated by the Yuma Proving Ground-Natural Environments Test Office (YPG-NETO), the US Military Academy (USMA), the Army Research Office (ARO), and the US Army Engineering Research and Development Center (ERDC). We especially thank Graham Stullenbarger, Wayne Lucas, Linda Spears (YPG-NETO), Russell Harmon (formerly of ARO), Chris King (formerly of USMA), Dan Gilewitch (formerly of USMA), William Doe (formerly of Colorado State University) and Chuck Ryerson (ERDC-CRREL) for many insights regarding test and evaluation in extreme environments. Partial funding for this project provided through YPG contract No. W9124R-07-C-0028/CLIN 00001-ARCN-AA and ARO grants DAAD19-03-1-0159 and W911NF-09-1-0256. 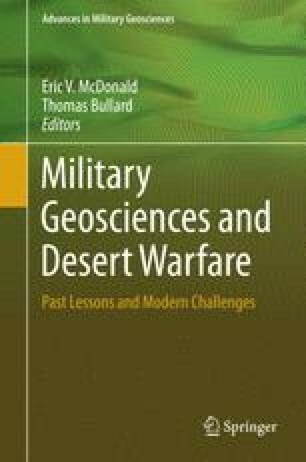 Any opinions, findings, and conclusions or recommendations expressed in this material are those of the author(s) and do not necessarily reflect the view of the U.S. Army, the U.S. Army Research Office or the Yuma Proving Ground.